Tiko United FC, from the small city of Tiko in the southwestern Cameroon (approximately 60 000 inhabitants), has against all odds became a powerful club in Cameroonian football. The Samba Boys, as the club is called, won the MTN Elite One in 2008-2009 and became third in 2009-2010. The club had impressive defensive records in both 2008-2009 and 2010-2011, but has struggled during the current campaign. At the time of writing, Tiko United FC is number 7 in the MTN Elite One 2010-2011 and only AS Lausanne has conceded more goals. Guy Nzonkou (born 25.03.1979) is first choice goalkeeper. Nzonkou was runner-up when the best player of January 2011 was awarded by Fecafoot. Nzonkou is an experienced and confident goalkeeper, formerly of Union Douala. Competition is tough and Chidiobi Festus Ebere (born 01.01.1983), apparently born in Nigeria, and Oumarou Idrissou (born 18.03.1986) pushes hard for the number one shirt. The defence of Tiko United FC is centered around central defender Joel Djondang, veteran Etienne Kibong Lam (born 29.11.1977), Ransom Etengeneg Akangmba (born 11.03.1990) and Hervé Ngane Ayo. Petit midfielder Medrano Tamen (born 29.03.1986) is a skillful and hard-working player who was part of the Cameroon team for the FIFA Beach Soccer World Cup in 2006. Tamen is a former player of Cotonsport FC. Arsene Etah Bate Eya (born 19.07.1987) and Souleymanou Mandjombe (born 03.05.1987) are other important midfielders. Mandjombe started the season at AS Lausanne and is a former member of the Cameroon B national football team. Mario Williams Elimbi has been one of the revelations of the season. Elimbi, formerly of Mount Cameroon FC, was considered for the Orange African Youth Championship in South Africa but did not make the final squad. The versatile Abdel Aziz Moumie (born 24.04.1986) is a key player and has been captaining the team from time to time. Experienced striker Valentine Atem (born 26.08.1979) joined Tiko United FC before the season and was an instant success. Atem made headlines in Ghana when he was the star striker of AshantiGold SC and later went on to play professionally in Germany for Eintracht Braunschweig, SV Wehen and MSV Duisburg between 2007 and early 2009. Atem has unfortunately been struggling with injury since joining Tiko United FC, and the other strikers at the club, primarily Alain Nkafu (born 21.11.1985), David Ambeno Ake (born 26.05.1985), Elvis Mokake Ndambe (born 06.09.1982) and Kelvin Agbor are left with huge responsibilities. Agbor is highly regarded in Cameroon and is a former playmaker of Mount Cameroon FC and Union Douala. Ake is in his sixth season at Tiko. Mokake is a former professional at Olympic Club Safi from Morocco and has a great reputation in Cameroonian football, although he has been quiet the last couple of seasons. Union Sportive de Douala, mostly referred to as Union Douala, is historically one of the biggest clubs in Cameroon and the top club from Cameroon’s biggest city Douala. It is fair to say that the club has been underachieving for the last couple of seasons. The club has always bought quality players but the problem seems to be turning the individuals into a well-organized collective. However, their current team is from my point of view one of the most exciting in Cameroon, mixing experienced players with some of the country’s biggest talents. Union Douala is currently third in the MTN Elite One 2010-2011 and should be a team to check out for any scout looking for African players. A couple of days ago, goalkeeper Janvier Mbarga (born 27.09.1985) was named in a rather exclusive list of local players who will participate in training sessions with a view to join the Cameroon national football team. Mbarga, formerly of Canon Yaoundé and Cotonsport FC, is widely regarded as one of the finest goalkeepers in Cameroon but the inclusion was nevertheless surprising as Rostand Youthe Jehu (born 23.12.1985) seems to be first choice goalkeeper at Union Douala at the time of writing. Youthe Jehu is a former professional in South Africa for Durban Stars FC and joined Union Douala from Sable FC before the current season. Youthe Jehu has played 10 matches so far this season, while Mbarga has played 5. Four other players of Union Douala were asked to join the training sessions described above; central defender Jacques Bertin Nguemaleu (born 02.09.1989), defender Gustave Moundi (born 16.02.1985), midfielder Gérard Bakinde Bilong and attacker Charles Edoa Nga (born 17.05.1990). Nguemaleu and Moundi are the two commanders of the Union Douala-defence. Nguemaleu, usually the captain of the team, has been ever present this season and has a lot of experience with the Cameroon B national football team despite being only 21 years old. The picture is Nguemaleu and is taken from oncameroon.com. The left-back is usually Cyrille Maka Ngoye while the experienced Jacques Franck Boma Liliba and Ngansop Megaptche, signed from Young Sports Academy before the season, both are utility wing-backs. Defensive midfielder Alexandre Nsangue was rather shockingly to me not included in the Cameroon-squad for the Orange African Youth Championship in South Africa. It is possible there is some injury-situation I don’t know of. Nevertheless, Nsangue was one of the best Union Douala-players in 2009-2010 and has been a regular member of the Cameroon U-20 national football team for the last couple of years. 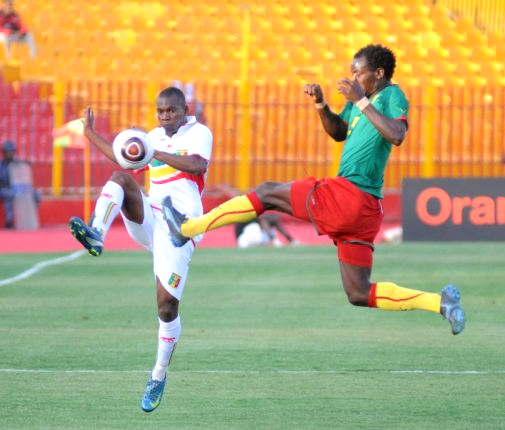 Alexandre Bissi and Bakinde Bilong, who has been part of both Cameroon B and Cameroon U-20 the last couple of years, are regular midfielders while Julio Mbaidiguim and Cedric Mbarga often are found on the wings. The signing of attacking midfielder Ludovick Yvon Mintya Angoh (born 08.12.1987) could prove to be a stroke of genius. Mintya Angoh, who played for Tiko United FC in 2009-2010, has been commanding since he joined the club and has already scored two goals in five matches. Expectations are high when it comes to striker Jean-Paul Onguene, most likely born in 1991. Onguene was the top striker at AS Lausanne when they won promotion to the MTN Elite One last season. At the time of writing, Onguene has yet to score for his new club. Onguene is known for his dazzling skills and is a very confident player who I think will shine when given time. Edoa Nga is a lively attacker who played for the Cameroon U-17 national football team in 2007 and was part of Cameroon B in late 2010. He is the current top scorer of Union Douala with three league goals, the same number as attacker Eboa Mbock Mbonjo, signed from local rivals Matelots de Douala before the season together with experienced striker Joseph Ntombe Ngome (born 05.10.1982). Ntombe Ngome is sometimes referred to as “Ribery”. Union Douala recently brought Emmanuel Njock Mangoung (born 17.03.1987) to the club. Njock Mangoung played a total of 15 matches, without scoring, for top level Turkish club Kayseri Erciyesspor during 2008-2009 and 2009-2010. Another new signing is the rather mysterious Innocent Lock who has been impressive and who I’m trying to find more information about.